Magne and fellow artists Kjell Nupen, Ørnulf Opdahl and Queen Sonja of Norway gave a large number of journalists a preview of the group exhibition Under stor press at Dunkers Kulturhus in Helsingborg, Sweden yesterday (see October 27th news update for more info about the exhibition). Queen Sonja is exhibiting her art in public for the first time, and was really the center of attention. “I think she’s got courage who has chosen to expose herself to the type of questions that are bound to come, when she sticks her neck out like this. I can definitely relate to that, being famous for one thing and then venturing into a completely different field”, Magne told Aftenposten’s web-TV. He could be seen standing in front of 10 large prints from Futura Plus, covering an entire wall. Today there’s a vernissage for invited guests, which will also be attended by King Harald and Crown Prince Haakon of Norway and Queen Silvia of Sweden, before the exhibition opens to the public tomorrow. Under stor press will be open until August 5th next year. Update: A few more interviews with Magne in Helsingborg have now appeared online. TV2 has a video report which can be seen here. There is also an interview at Dagbladet.no. “This time I mistakenly received a bag full of unwashed hospital sheets, straight from the emergency room, that were badly stained, creased and smelt horrible. 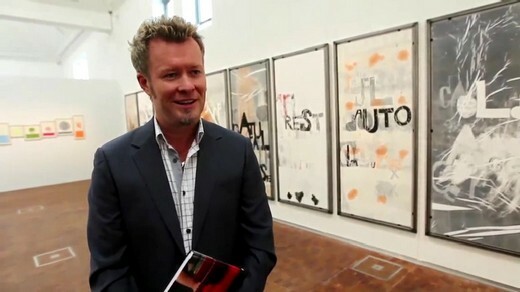 That felt like a starting point for a series of prints based on hospital situations”, Magne tells TV2. “The prints are 200×80 centimeters. That’s the original size of these hospital sheets made by manufacturer Futura Plus – which inspired the name of my exhibition”, he told Dagbladet.